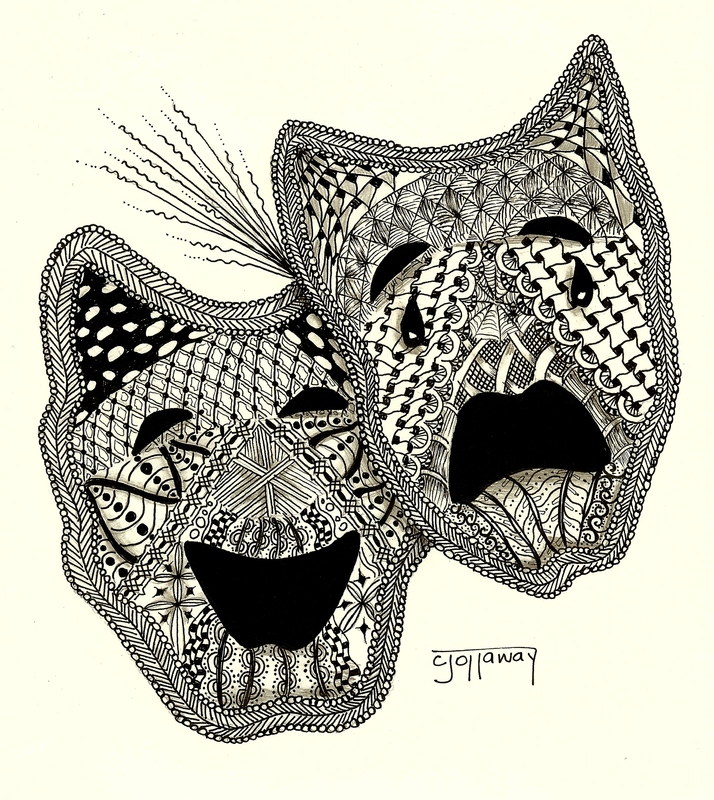 Just how awesome can a Zentangle be? I guess this AWESOME! Though I have way too many hours in this and I’m very excited how it turned out. My niece Leigh is studying theatre in college and was the inspiration behind this piece. I was looking at her pictures on Facebook and I was thinking how cool…the pancake make-up… the costumes…the lighting…..Then, BAM! the Theatre Masks were born. I like when ideas sneak up on you and hit you like a ton of bricks! Leigh is such a beautiful individual inside and out and I’m very excited to see what her future holds because I guarantee that it will be just spectacular! BTW, I’m still working on the Van Gogh painting and it’s still going horrible, but I’m trying to hang in there! I appreciate the art but those things creep me out! spectacular! Just don’t understand how you do it. My guess is just plain talent. What a unique take on theatre masks! I like the zentangle design, and your drawn dog portraits are awesome. Great job on everything! absolutely amazinggggggg I LOVE MASKS,,IN my stuff,that is packed away, I have dozens ,,, but none as intricate as these..hoorah Ms thannggg you can rock it with you abilities!!!! !